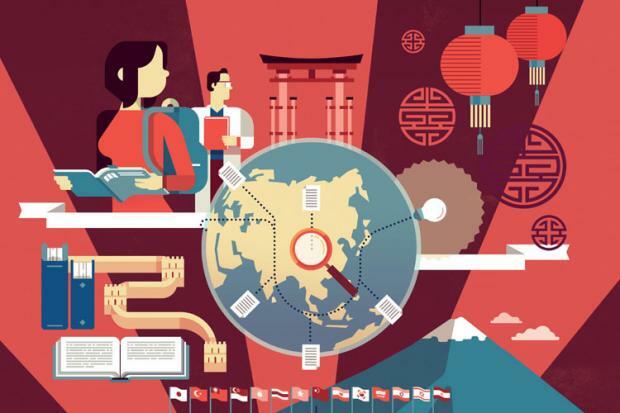 China has overtaken Japan as Asia’s number one nation for producing top universities. While Japan’s University of Tokyo is the highest-placed institution in the Times Higher Education Asia University Rankings 2015, the country has lost ground overall, with the balance of power now tilting towards mainland China. Japan has 19 universities in the prestigious top 100, down from 20 last year and 22 in 2013, and 15 of those have slipped down the list, by an average of 5.8 places. By contrast, mainland China now has 21 representatives, up from 18 last year and 15 in 2013, and many of these are rising up the table, including Peking University (fourth) and Tsinghua University (fifth), which have both moved up a place. Wuhan University has also climbed an impressive 15 places to joint 49th. China’s special administrative regions are also performing well, with all six of Hong Kong’s ranked universities in the top 50, while Macau has made its debut in the table with the University of Macau entering in joint 40th place. The shift in power towards China takes place against a backdrop of investment in research and development while Japan wrestles with cuts as a result of its crippling level of public debt. Gerard Postiglione, director of the Wah Ching Centre of Research on Education in China at the University of Hong Kong, said that Japan’s declining performance is due to a combination of “a lot of inbreeding” at its universities (graduates teaching at the same university at which they studied); research funding being concentrated at its top-tier institutions; and fewer promotion opportunities for young academics. “[China] started from scratch and rose quickly from the 1990s when they didn’t have world-class universities, whereas Japan was already at a pretty high level, so its productivity has levelled off for a few years,” he said. Simon Marginson, professor of international higher education at the UCL Institute of Education, agreed that higher education in Japan is “now largely standing still”. “Japan is careful to maintain the leading edge of its very top universities such as Tokyo and Kyoto, but has been less committed than has China to pumping more investment into the universities on the next level,” he said. Taiwan’s performance is continuing to decline – six universities have fallen out of the top 100 since the rankings’ first year in 2013 – while India’s progress has faltered, with the majority of its institutions losing ground.